Onsite measurement is necessary to preserve sample integrity and ensure data accuracy for the following field measurements: water temperature, dissolved-oxygen (DO) concentration, specific electrical conductance (SC), pH, and reduction-oxidation potential (redox/ORP). 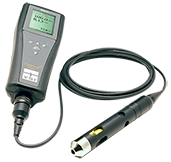 A variety of single-parameter and multiparameter field-measurement instruments are available that use various technologies to measure the same water property and that require differing calibration, maintenance, and measurement methods. 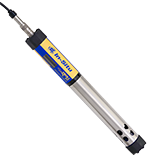 Multiparameter instruments that contain sensors (each specific to the measurement of a given physical, chemical, or biological property) that are bundled in a single housing (a sonde) and deployed in environmental waters. Efficiency is increased. Instruments are easy to clean, calibrate, and deploy. The time required to collect discrete samples for determining field properties is minimized. The time needed to measure and record multiple field properties is reduced. In situ measurement is likely to be more accurate and precise than measurements made in samples removed from their source. Instruments can store data, either in a display device or to internal memory. Instruments may be capable of longterm deployment. Turbidity, which can make water appear cloudy or muddy, is caused by the presence of suspended and dissolved matter, such as clay, silt, finely divided organic matter, plankton and other microscopic organisms, organic acids, and dyes. The color of water, whether resulting from dissolved compounds or suspended particles, can affect a turbidity measurement. Regulating and maintaining drinking water clarity. Determining water clarity for aquatic organisms. Indicating visual impairment in water. Real-time monitoring that indicates watershed conditions. Developing surrogates for concentration of suspended sediment (SSC) and other constituents. Monitoring the effects of land development and related human activities and subsequent management of natural resources. Determining transport of contaminants associated with suspended materials. Often the changes in water measurements are more important than the actual measured values. Depending on the manufacturer, some instruments can store instantaneous or continuous measurements to internal or external memory in a format compatible with a hand-held display, personal digital assistant (PDA), or laptop computer.